When I was young, I learned a song in school. It was a round with one simple line: Make new friends, but keep the old. One is silver, and the other gold. 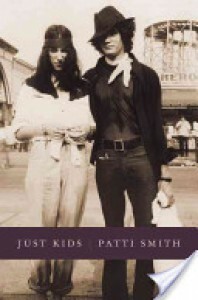 The memoir Just Kids focuses on the author Patti Smith's relationship with Robert Maplethorpe, who was to become one of America's most important avant-garde photographers. Early chapters describe how the two find each other, penniless in New York, and then in an on-again-off-again romance, co-create and support each other's artistic growth. There are hints that this book has been edited down from something larger, making for a bit of uneven pacing. But Smith wisely skips the details of her music career and puts the spotlight on her feelings and concerns for Robert and the strength of their oft-tested bond. As their careers blossom and their paths diverge, you can feel the sadness and tension grow in the story. On some level, this great rock&roll queen wanted nothing more than to have her best friend with her for always, like a little girl at Coney Island. When it's all said and done, this is the secret of Just Kids' narrative power- that it taps into that aspect of all our own (comparatively ordinary) lives and reminds us how hard it is to keep our friends close and safe through the swirling currents of individual experience. I often will listen to an audiobook on a high speed, but there was something about this story and Patti Smith's voice that demanded a real time experience. Smith is a poet, and one can feel that in the weight of her spoken words. I highly recommend the audio version.